As I've mentioned before recently, I've been making a daily effort to eat my GBOMBS. That's greens, beans, onions, mushrooms, berries, and seeds. Vegan doctor extraordinaire Dr. Fuhrman recommends eating those things everyday for optimal health, and it sounded like a good habit to adopt. Some of those things were already so common in my daily diet that they didn't take any effort to work in, but others, like mushrooms, take some planning and forethought. I've been eating way more mushroom-based entrees these days in my effort to work them in. It helps that Paul, who is trying to eat more vegan meals, also loves mushrooms. 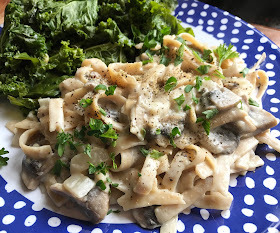 I made this Mushroom Stroganoff Pasta for dinner one night this week, and it's so easy and delicious that I just had to share the recipe. While the pasta is boiling, melt the butter in a skillet. Add the onions and saute for about 2-3 minutes or until they begin to soften. Add garlic and saute another minute, stirring constantly. Add the mushrooms and saute for about 10 minutes or until mushrooms are soft. Transfer the cooked vegetables to a bowl and set aside. Pour the veggie broth into the skillet and bring to a boil. Whisk in the flour, one tablespoon at a time until it forms a gravy. Add the sour cream and stir to combine. Add the mushrooms back in and heat through. Stir the mushroom sauce into the cooked pasta and serve. Taste for salt and add as much as you think it needs (this will vary depending on how salty your veggie broth is). Season with black pepper to taste. Garnish with fresh parsley. Oooh this looks amazing!! Thanks for sharing the recipe! Definitely will have to give this a try. 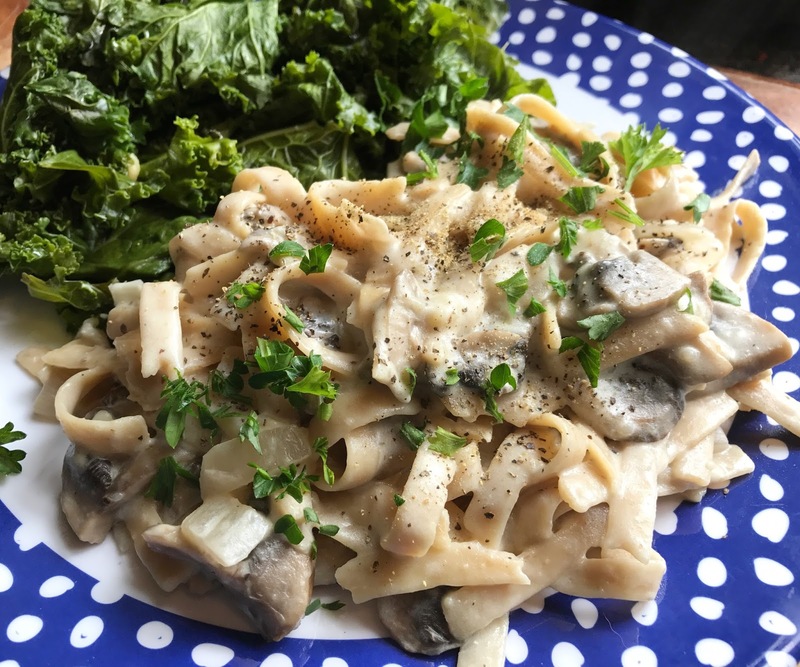 I've been wanting a delicious vegan stroganoff recipe for the longest! Definitely giving this a try. I don't eat enough mushrooms to be honest. And every time I have them I think how delicious they are. Mushroom stroganoff is one of those things that I love but that I've never cooked for myself! Your version looks super simple and delicious so I'm bookmarking it for a future cooking adventure.